Smartphones to monitor malnourished children! In my column of September 2015 I presented a scenario where health care workers in the field will be using smartphones to monitor patients in the future. This lead to a flurry of ‘Internet chatter’ questioning when this would really happen and whether it is really possible in Sri Lanka. Well folks, we are on our way there. 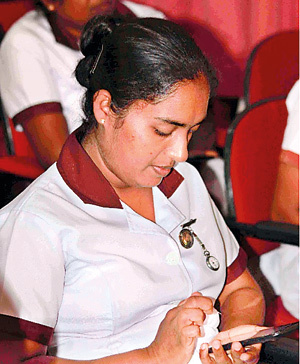 Within a year of that article we now have 600 midwives in Polonnaruwa, Matale, and Nuwara Eliya districts using smartphones to monitor malnourished children in their districts and we can monitor them from Colombo! The app that we developed to do so even won an international award – the mBillionth Award awarded by the Digital Endowment Foundation, India and Google. Yes if there is a will there is a way, real progress is possible in this country. This column written with contributions from my team illustrates this system. In spite of substantial performance in many aspects of the preventive healthcare sector (you may have heard that Sri Lanka was certified as having eradicated Malaria few days ago) sadly nutrition indicators in our country continue to fail to stay on par with the rest of the health indicators. 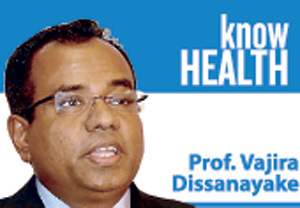 A significant proportion of Sri Lankan children are victim of various forms of malnutrition which has reflected negatively on the country’s development agenda. Scientific evidence has shown that nutrition in the first 1000 days of life is decisive for the level of physical and cognitive development of the individual and hence has an impact on national productivity. The District Nutrition Monitoring System (DNMS) was proposed as a solution to this challenge and the information system development and training were entrusted to the Health Informatics Society of Sri Lanka by the Nutrition Secretariat of the Presidential Secretariat. The task was undertaken by Dr. Pamod Amarakoon, a Medical Doctor who was reading for his MSc in Biomedical Informatics under the supervision of Dr. Roshan Hewapthirana, CEO, HISSL and myself. We collaborated with the Ministry of Health. The collaborators from the Ministry side during the crucial final stages of the project implementation were: Dr. Rasanjali Hettiarachchi, Director, Nutrition Co-ordination Unit, and Dr R. R. M. L. R.Siyambalagoda, Deputy Director General, Public Health Services II. The team at the Family Health Bureau lead by Dr. Sapumal Dhanapala also played a crucial role. The funding for the project came from UNICEF with Dr. Renuka Jayatissa and Dr. Gamini Jayakody playing a key role from there. Our software development partner was k-soft. The DNMS consists of two components; (1) data collection by midwives using a mobile application for Android based smart phones and storage of the data on a central server and (2) monitoring and evaluation by administrators using a web portal. The mobile application component of DNMS is capable of gathering information of malnourished children categorising the severity of the nutritional problem to facilitate nutritional interventions. At the same time, the system has a facility to record the underlying causative factors and facilitate channelling this information to multi-sector stakeholders based at the Divisional Secretariat of the area so that they can take corrective action at the household level – such corrective action may include providing nutrition supplements to the family, financial assistance to begin a home garden, etc. In villages malnourished children are identified at community health facilities and weighing centres. Malnourished children identified at these clinics will be registered in the DNMS using the smartphone by the midwives. At the same time they will identify the risk factors in the household of the child that contributed to this situation and enter them into the system. The children entered into the system will be followed up in subsequent visits at field clinic or at their homes. The data collected through the mobile device is transferred to the central server in real time. The data transferred to the central server is verified and approved by the supervising officers, such as Supervisory Nursing Sisters and Medical Officers of Health. Once validated by the supervising officers in the field, the data is be available to higher level health authorities for analysis and decision making. Public Health Midwives positively accepted collecting data using the DNMS mobile application. They provided valuable input to improve the mobile application and the quick start manual. It was observed that within several hours the Public Health Midwives grasped the core concepts of DNMS. During the training sessions, they were enthusiastically attempting to register children from the field allocated to them. Some of the Medical Officer of Health areas tried a similar approach to identify malnourished children using paper records. Hence the DNMS concept was welcomed by Medical Officers of Health as a means to improve the current process. The mobile interface was simple and easy to understand. It was observed that Public Health Midwives learnt the DNMS data entry process quickly. Health staff highly appreciated the on-site hands on nature of the training. According to some of the Public Health Midwives, DNMS training was a motivation for them to use ICT for their routine work. Smartphones were seen as a challenge initially. However, we learnt that due to the very focused nature of mobile applications, training Public Health Midwives to use smartphones and mobile data entry was less time consuming than giving them general ICT training. Similarly, we noted that the learning curve using mobile phones was steeper to desktop applications, especially for less IT savvy health care workers. This includes creating Gmail accounts for them to register to the Google App store to download the DNMS application. Lack of mobile coverage in some Public Health Midwives areas was a challenge to the DNMS design. However, we used a store-and-synchronize approach to overcome the issue and Public Health Midwives were able to successfully use this in areas with low mobile Internet coverage. The after-sales support was negotiated with the smartphone vendor. We were able to device a service model which can be replicated in island-wide scaling of the application. Providing a monthly mobile Internet data bundle for Public Health Midwives was another challenge. Currently, UNICEF is providing a monthly Internet allowance of Rs. 200 per Public Health Midwife. Two leaves and a bud: Will it survive the 21st century? 4th Industrial Revolution: Are we prepared for iGen?